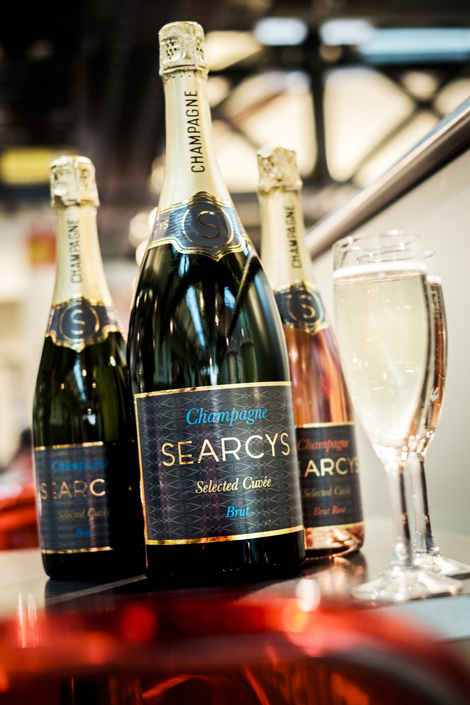 Founded in 1847, Searcys began as a catering service for the large private houses in London and the home counties that lacked full-time staff. It still runs the kitchens at historical attractions such as Blenheim Palace and the Roman Baths, but the group has grown its own portfolio of restaurants and champagne bars, now offering nine venues in London. 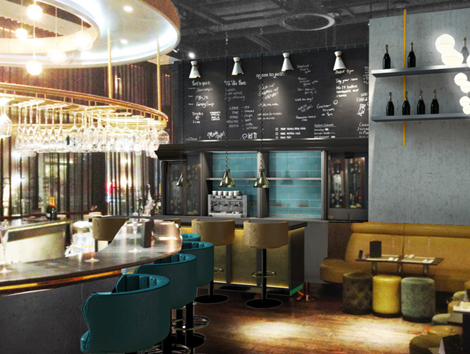 Relaunched this month is Searcys champagne bar at One New Change in St Paul’s, introducing an Italian “street-dining” menu with meatballs as the signature dish. This is the first of the group’s restaurants to launch the “champagne and meatballs” concept, to be followed in coming months by the group’s other London venues. The One New Change shopping and dining complex has recently opened a few new venues, but being close to the escalators on the first floor the restaurant was easy enough to find. Inside, a large circular bar dominates, with low tables, leather pouffes and armchairs populating the rest of the seating area (60 covers). These offer more privacy than if seated at the bar, but struck me as a less lively experience. The interiors are art deco-inspired with a few rustic touches such as chalkboards and traditional meat grinders. The venue is available for private hire, accommodating 120 guests standing. Hanging from a golden rack above us were rows of champagne flutes, saucers and wine glasses that glinted in the light from the spotlights above. The maître d’ introduced the meatballs concept as an effort to make champagne more of a “day in day out” drink, with Italian street food dishes reinforcing the sense of informality. A range of vermouth-based and “frizzante” or fizzy cocktails has also been brought on board. After a rundown of which cocktails would suit our palates, I tried La Bella Rosa, the signature cocktail made with Cocchi Rosa vermouth, balsamic, tonic, basil and cracked black pepper; a strong blend of flavours, brought out by the black pepper in the same way when cracked onto strawberries. My companion had a Vesper, made with Tanqueray 10 and Cocchi Americano. There are more than 20 champagne brands on offer ranging from £70 for a bottle of H.Blin, Blanc de Noirs to £180 for a bottle of 2005 vintage Taittinger. Four Brut champagnes are available by the glass – Searcys Champagne Cuvée Brut NV, Besserat Grande Tradition Brut NV, H Blin Brut NV and Laurent-Perrier Brut NV. Three Rosé champagnes are available and also a Laurent-Perrier Ultra Brut, NV. The restaurant promotes a different label each month – May is Laurent-Perrier, but we went for Searcys Brut, which was fruity and refreshing. The compact menu gives a few, “pick and mix” options to enjoy with your champagne. Aperitivo dishes include cheese and cured meat boards and meatball sliders in a brioche bun. Salads and savoury dishes include crab and fennel, Sicilian orange and Castelfranco lettuce; smoked salmon ciabatta, mascarpone and artichoke; and Sicilian tomatoes, wild garlic, pecorino Sardo and crispy shallots. Meatballs being the main event, we were offered a number of options in our dish; first, the choice of beef and pork, just beef, or potato gnocchi as the non-meat option. Next was sauce – pesto, tomato and basil or tomato and pancetta, and finally the option to pair our meatballs with ciabatta or pasta – paccheri (rigatoni without the ridges) or trofie, made from durum wheat. You can also choose from a range of toppings including crispy shallots, gorgonzola, artichokes, prosciutto, anchovies, smoked almonds and capers. We shared the meatball sliders, a bowl of paccheri and beef meatballs in tomato and basil sauce with gorgonzola topping, plus a salad of burrata, cherry tomatoes, peas, mint and olives. Our waiter asked if we wanted the dishes to arrive together, which was useful for trying different elements together. Combined with the meatballs, the creamy burratta balanced out the richness of the sauce, which was aromatic and well seasoned. The pasta was cooked on the chewier side of al dente, which I prefer, and went well with the fresh cherry tomatoes and mint from the salad. Served on a wooden slab, the sliders were delicious – though there was a lot of bread, and not so much meat. We finished with a tumbler of the Cocchi Americano vermouth – a robust drink to end the dinner. It took about ten minutes after we arrived for our waiter to notice (there were four or five other parties sat at the bar), but once he did he was generously attentive and helpful in his recommendations. A pleasant after-work spot for sharing dishes and a few flutes of fizz. The comfort food and champagne concept works well as a theme and makes a good option for casual meetings and light bites. 11am-11pm Mon- Fri, 12 noon-10pm Sat, 12 noon- 6pm Sun. Appetisers range from £8.50 to £15, meatballs with pasta £9, or with ciabatta £8 with toppings £1.50. Salads and savoury dishes range from £7 to £10. Vermouth cocktails £7 to £8, classics £9.50 and a 150ml glass of champagne from £10 to £18.50.